Google on Thursday introduced video chatting capabilities to Android phones, akin to Face Time on Apple iOS devices, as part of version 2.3.4 of the mobile operating system. Other Android apps already offer video chatting capabilities, but Google has built the feature into the OS and also allows interoperability between Android phones and tablets and computers. The video chatting feature has been integrated into the Google Talk application, and unlike Apple's Face Time, works over Wi-Fi and 3G/4G (as long as your carrier and data contract allows you). 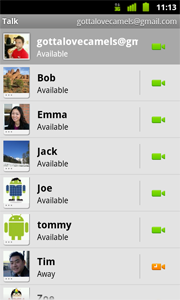 A video or voice chat button will appear in the Google Talk friends list next to your contacts. While video chatting, any text chats from that person will also appear overlaid on the video. When switching to a different application while video chatting, video will be paused while audio will continue to run in the background. Users of the Nexus S smartphone (built by Samsung for Google) are the first ones to receive the feature, as part of a new version of Android (2.3.4). Other Android 2.3 devices will receive the update incrementally (read slow), as usual, over the air. "You can now video or voice chat with your friends, family and colleagues right from your Android phone, whether they're on their compatible Android tablet or phone, or using Gmail with Google Talk on their computer," Google's Product Manager Colin Gibbs and Wei Huang, tech lead, write on the official Google Mobile Blog. This is similar to Apple's Face Time video chatting solution, which allows communication between front-facing camera-equipped iOS devices and Mac computers. But the advantage of Google's solution right now is PC compatibility (works with video chats from within Gmail on most browsers) and 3G/4G capabilities, as well as text on video overlay. If you are searching for interoperability between iOS and Android video chatting, you can check out Fring, which not only connects Android and iOS (including iPhone 3G/S) users, but also works over 3G/4G and Wi-Fi and allows for group video chatting sessions of up to four people. To see how Google Talk with video chat works, check out this explanatory video from Google.